I don't often read fiction reviews, primarily because I ended up finding too many things I want to read, but not long ago this one caught my eye as I was perusing a review journal at work. Anything that takes place at the cold outer edges of the world intrigues me, and this book is set in Greenland. I've read two other books set in Greenland and posted about them here, but this book is very different from either of those. 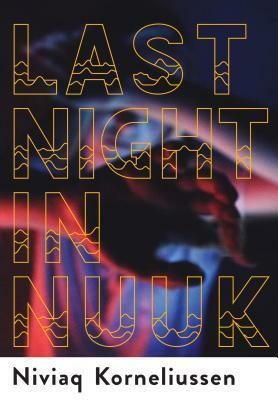 Set in the capital city of Nuuk, this short contemporary novel is about five people whose lives are intertwined. The book is divided into five chapters, one from the perspective of each character: Fia, Inuk, Arnaq, Ivik, and Sara. Fia's chapter begins with an ending - she breaks up with her boyfriend, Peter, and finds herself surprisingly attracted to a woman she meets, Sara. Fia is temporarily staying with her brother Inuk's friend Arnaq, who is attracted to Sarah's partner Ivik. Arnaq is drunk and reckless and betrays Inuk by revealing something he told her in confidence. It's all a little confusing when I describe it here, but not when you're reading it. This book could have easily been 300 pages, but Korneliussen's writing is quite lean and the whole thing is only 173 pages and includes text conversations, hashtags, a multiple choice form, and a few pages with only one or two lines on them. So it felt a little experimental, but I think it works. I don't remember what I read in the review - basically I saw "Greenland" and put it on my To Read list - so I didn't know what to expect from the story when I started it. It's heavily LGBT (with basically all of those letters represented) and it made me wonder a lot about the larger culture in Greenland and how accepting people are. I didn't get a lot about that from the story. It's pretty straightforward and doesn't go into much about the characters backgrounds or anything beyond what is happening at the moment. There was also a bit about one of the characters being in prison that I didn't really understand, and I still don't know if it was a literal or figurative prison. It took me a bit to get into this book, but once I did I flew through it pretty quickly. Had it not been so short and quick I may not have finished. For what it was, I liked it well enough, but I don't know that it's a book that will have a lasting impression on me.